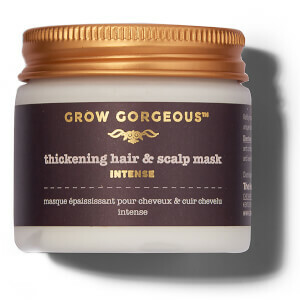 Ideal for dull and lacklustre locks, the Grow Gorgeous Scalp Detox unlocks the secret to healthier hair regrowth - a healthy scalp. A potent blend of minerals helps aid moisture levels while absorbing excess sebum, extending time between washes, with Bean Bio-ferment working to neutralise UV light and free radical damage for optimum protection. 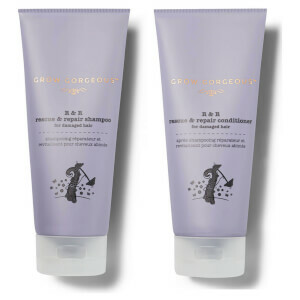 Suitable for use as an intensive weekly treat, the pre-wash treatment leaves the scalp feeling rigorously purified and fresh, with enhanced stimulation to promote lustrous, revitalised hair and improved re-growth capabilities. Close lid tightly after use. Store in a cool dry place. Due to the high content of natural oils and extracts, it is normal for the color to vary over time. This does not alter the effectiveness of the product. For external use only. Avoid contact with the eyes. Stop using this product if you develop redness or itching. Wash skin with plenty of water following use to remove any residual product. If the product enters the eye, rinse thoroughly with plenty of clean water. Aqua (Water), Glycerin, Hydrogenated Castor Oil, PEG-6 Caprylic/Capric Glycerides, Lactobacillus/Punica Granatum Fruit Ferment Extract, Carbomer, PEG-40 Hydrogenated Castor Oil, Parfum (Fragrance), Lactobacillus/Dipteryx Odorata Seed Ferment Filtrate, Phenoxyethanol, Sodium Hydroxide, Menthol, Menthyl Lactate, Leuconostoc/Radish Root Ferment Filtrate, Allantoin, Disodium EDTA, Ethylhexylglycerin, Salix Alba (Willow) Bark Extract, Zinc PCA, Niacinamide, Sodium Starch Octenylsuccinate, Calcium Pantothenate, Maltodextrin, Butylphenyl Methylpropional, Limonene, Linalool, Sodium Ascorbyl Phosphate, Pyridoxine HCL, Tocopheryl Acetate, Silica. I got this in a glossy box and I LOVED IT. It makes me hair feel incredible and it’s now a favorite of mine. I would highly recommend!!! I got the in my Glossybox and I LOVE it! I exfoliate my face and body, but it never occurred to me to exfoliate my scalp! I love this stuff! My scalp gets SO dry and itchy, but this makes it so much better! I will definitely re-purchase! I got this in a Glossybox. It was very gritty and very thick. I think a tip on application to the root area would have been nice. I put a big dollop on the palm of my hand and applied to the top of my head thinking I could massage it in , but it did not smear around so easily. I would suggest making some separations in your hair then apply in multiple areas to be able to have it apply all over your scalp. While attempting to rub in and then rinse out ofter setting on my scalp for a couple minutes it made my hair feel very wirery and just not good, also the scent was VERY strong and very masculine to me. The scent lingered till the next day even after multiple washings and conditioner. The granules did not rinse out completely and I was picking out the little bits out of my hair/scalp till the following day. The end result was actually very nice. My hair felt amazing and looked great, it was light and had a bunch of bounce and body. My hair is usually weighed down and not much life since I have very thin hair. So I am on the fence about this because while the end result was fantastic, getting there was a bit of a pain. I actually used this product and then left it my hair for a couple of days. I then used some more and washed my hair. I like the Root Product better but this did make my scalp feel really clean! I hate the smell the first time I used it while my family liked it. My hair was really bouncy and a little bit glossier than before after the first applied. However, the exfoliating micro-beads was too difficult to wash out. It stays like hair flakes which looks awful. I recently got a sample of this product in the look fantastic advent calendar and ever since then I have not stopped raving about this to all my friends. Generally I wash my hair twice a week and with this I only need to wash once. It smells amazing my hair feels so good. I have very thick hair so I don’t use the other thickening treatments but this one is perfect and worth the money!! I love that it has a citrus like scent to it. However mine came with no seal on it so when I opened the jar there was just product that looked 25% gone. I don’t know if they come this way or if they’re supposed to be sealed off. I've had a dry scalp for weeks and went on the look out for a scalp scrub to help get rid of the dead skin cells - this product did just that! Worked an absolute treat on my scalp! Not only that but it left my scalp feeling revitalized and refreshed. I have never paid much attention to my scalp health before. Honestly, I didn't think it mattered, and the one other product I did try left my scalp and hair greasy and I ended up tossing it in the trash. but this! First of all, I love the way it makes my scalp feel. It sort of tingles. The scent is delicious, and best of all my hair and my scalp feel ALIVEd (that's the only word I can think to describe it.) 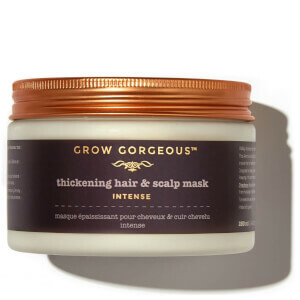 Thank you Grow Gorgeous. Thank you.